Nordic Lights is a Finnish company based in Pietarsaari and was founded in 1992. 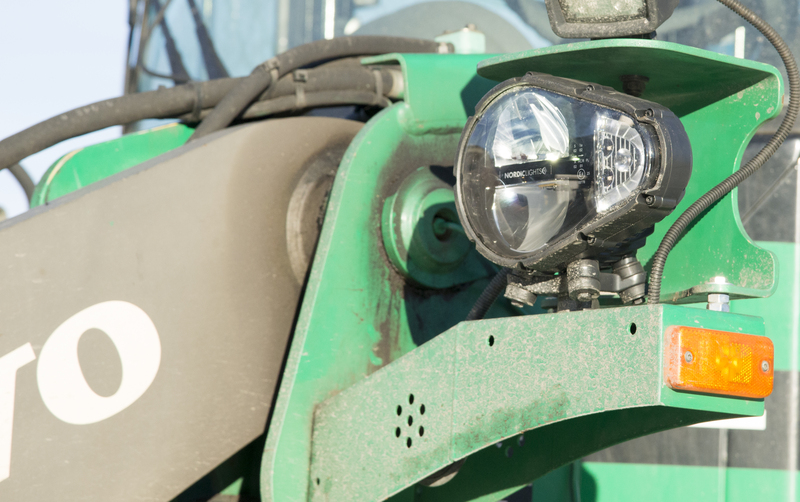 It is part of the Herrmans Oy Ab Group and is a manufacturer of premium, high-tech work and driving lights for heavy duty vehicles in extreme conditions. Its products are used throughout the mining, construction, forestry, material handling and agricultural industries, with clientele including industry leaders such as Caterpillar, Liebherr, Sandvik, Komatsu and Volvo. The company has developed to become an expert in lighting technology through its productive collaboration with partners in different branches of the industry. Continuous strategic investments in the R&D department, laboratories and the latest simulation software keeps Nordic Lights at the forefront of the industry. The R&D department plays a pivotal role in the success of the company. The developers and engineers of the Research and Development department constantly strive to create new and innovative world class lighting solutions. The department works closely with the manufacturing teams to ensure that only the strongest and most robust industrial lighting products are produced. These products are subject to rigorous testing and rely on industry leading inspection methods for quality assurance. 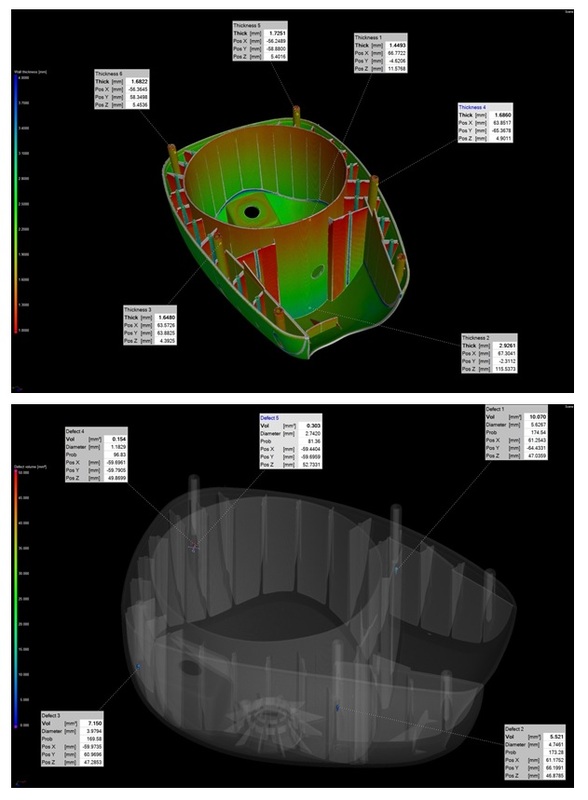 The visual reports detail wall thickness, dimensional inspection and void analysis of the plastic light cover. Complete assemblies are typically made from aluminium, steel, plastic and glass. The components are manufactured through a range of processes including die-casting, injection moulding and machining. Before passing inspection, all new products undergo extensive testing. These tests include lumen output and light distribution, vibration and shock, dust and humidity, heat and cold exposure, thermal cycling, thermal protection, electromagnetic compatibility, full functionality, abnormal conditions, chemical resistance and usability. For inspection purposes, Nordic lights previously relied on a white light system. A lot of components with ribs, pins and cylindrical holes are used in production, and the white light system typically has difficulty examining these. Scanning components with narrow or tight features is incredibly difficult when details are too deep for the light to detect. As the white light system is only capable of line-of-sight external surface inspection, internal defects were neglected. To gain a comprehensive picture of the inside, samples and products were subject to expensive and time-consuming destructive testing. Another problem with this inspection solution is that it requires parts to be painted and marked with alignment dots. Painting or powder spraying is needed as a part-preparation method for smooth surfaces to avoid reflections in the white light system. This however introduced critical measurement errors on optical surfaces, where precise tolerances are required. Not only did this result in critical errors, but the whole process was slow and time consuming. 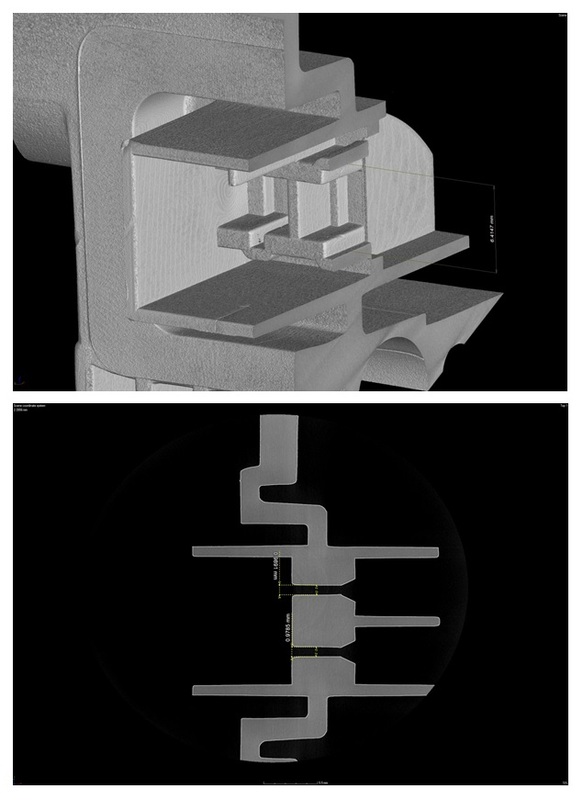 A new measurement solution, capable of analysing a variety of materials and both internal and external features with high precision and efficiency was required. The team consulted various suppliers to determine the best solution for their requirements. Carl-Anton Manns is a Test Engineer at Nordic Lights and took part in the search for the new system to supersede the white light system. He explains, “The instrument needed to be able to analyse smooth reflective surfaces with high precision. Being non-destructive was also a big plus”. Carl-Anton Manns – Testing Engineer at Nordic Lights. Dimensional inspection of a connector, including areas with no or limited line-of-sight. The Nikon XT H 225 ST with reflection and transmission dual-target system has since been installed at Nordic Lights, for R&D and troubleshooting requirements. It is critical for all components to be approved before they can be used in product assembly. The primary purpose of the CT system is to validate supplier samples and new parts, or modified parts from new moulds. A secondary purpose for the system is troubleshooting. During the test phase, if there are any failures, complete assemblies can be scanned to identify the root cause without having to open up or destroy the product. For troubleshooting, it has been used to search for air pockets or voids in the silicone glue between the aluminium housing and the lens, that have caused leakage. “Verifying the tool that makes the prototype part in the beginning of the project saves a lot of trouble later on. With Nikon CT, we can easily verify all dimensions and check for defects without needing to destroy samples. (This is important to preserve the samples for other inspection tests.) There are also important savings in time and money by avoiding sample preparation such as painting or cutting”, Carl-Anton notes. A major factor in the decision making process was the straightforward maintenance of the open tube source. A system with an open tube source makes for lower maintenance costs and vitally, reduced down time. The fast and competent service from Nikon support engineers, was also a critical point in the decision making process. 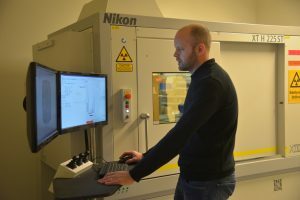 Carl-Anton Manns operates the Nikon Metrology XT H 225 ST, which is used to validate supplier samples and new parts at Nordic Lights. The Nikon Metrology CT system represents a significant step up from the previous method used in the R&D department. The white light system offered limited repeatability and low speed, which was a hindrance. The CT system addresses these issues and now makes it possible to scan almost every component before approval. The CT system reveals internal defects including air pockets and voids which is not possible with the white light system. Another advantage the CT system has is that it can provide the precise results for dimensions and tolerances of optical parts, lenses, light guides and reflectors that are demanded. Now with a non-destructive inspection system, Nordic Lights notes significant time savings, especially in the development phase. Defects can be identified, traced and eliminated before parts pass to production. For supplier submitted samples, new parts or new moulds can be compared to the CAD models before being used in the assembly of complete products. It is noted that the transmission target is not currently used extensively, and the reflection target is used primarily for the requirements at Nordic lights. However, Carl-Anton notes that it will become useful in the near future, as the high level of detail that can be achieved will prove to be a significant advantage. The system is not just a current solution, but is ready for the future too. Download the story as a PDF here. Read the previous CT blog post about Nikon’s global X-ray User Forum here.